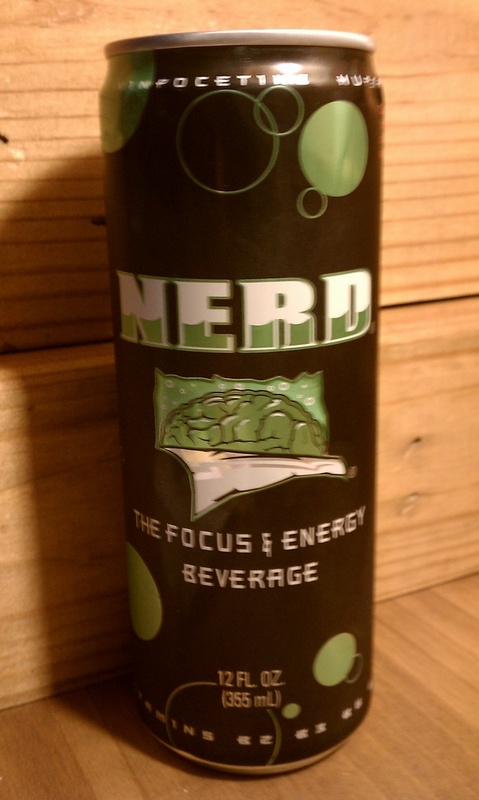 Today I am reviewing NERD focus and energy beverage that comes out of the great state of Texas. I reviewed a case of samples to enjoy which I also shared with friend Chris and my sister. NERD is a different type of energy beverage focusing on mental stimulus as well as the typical energy effect. The four major chemicals that are in the beverage to accomplish that are: DMAE, Chinese ginkgo, Vinpocetine, and Huperzine A. I have no clue what each one does but thankfully the can itself has a brief explanation of each. Vinpocetine supports mental alertness by increasing oxygen and blood flow to the brain. Huperzine A helps maintain that alertness, memory function, and the break down of acetylcholine. DMAE is the precursor to the neurotransmitter acetylcholine and users report better focus and mental clarity. Chinese ginkgo bilbao supports acuity and memory with positive effects on the vascular system. If you don’t know what acetylcholine its a neurotransmitter that in particular is released in higher volume when caffeine is introduced to your system. Now that you are educated in the extra parts of this beverage formula let’s get to the real reason you read this. How does it taste and does it work? On opening the can or even cracking it you get the smell of fruitiness flowing to the nose . The color is a brilliant clear lime green. The first taste brings what my friend perfectly commented, “It tastes like lime Hawaiian punch!” I agreed with that instantly the first time I tried it. It additional to the first tasting description I can tell you NERD has a sort of slight creaminess on the tongue as the sweetness roars in. It is very sweet but the funny thing is a can only has 42g of sugar which is a little less than a can of mountain dew, which I use as my sugar benchmark. Yes and yes. This energy beverage works great I feel more alert and I have more focus to get tasks done. The taste is very energy beverage friendly and doesn’t have that sometimes awful aftertaste . Overall it’s a very drinkable beverage. I hope you give NERD a try and I hope maybe you learned something this review. Is this in stores outside of Texas? Or do I have to get some online? Looks good. Can design is awesome. @thefoodjunk – we are still a young company…our main distribution right now is primarily Texas. We are working on relationships in other states in order to bring NERD nationwide in the future. Follow us on twitter (@nerdbeverage) and facebook (http://www.facebook.com/NERDbeverage) to participate in giveaways and to find out more!